Behind the scenes of "Marcos: The Fall of a Dictator" and "Cory Aquino: The Housewife Who Led a Revolution." 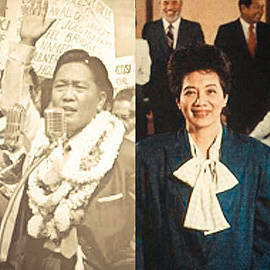 Among the country’s staggering list of political icons, none were ever as influential as the late Corazon Aquino and Ferdinand Marcos. Both controversial in their own right, the former Presidents ruled during a time of deep political strife, when the drama that came with Philippine politics was at an all-time high. The new documentaries "Marcos: The Fall of a Dictator" and "Cory Aquino: The Housewife Who Led a Revolution" aim to provide an in-depth look at the lives of former Presidents. Commissioned by History Asia, the project was meant for an international audience and was and took six months to finish. 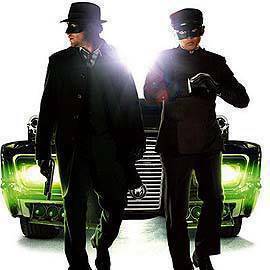 They will be aired on the History Channel starting January 23 until February 18. See the complete schedule below. From the History Channel website: "The President of the Philippines from 1965 to 1986, his initial promise was overshadowed by a totalitarian regime marred by corruption and murder." "From the time we did the documentary Batas Militar way back in 1997, we've tackled this topic many times," says director Jeannette Ifurung. "It was just a matter of telling the story in a way that an international audience, who knows nothing about the Philippines, will understand. But at the same time, also give something new for the Filipino audience who have seen and heard this story many times over." 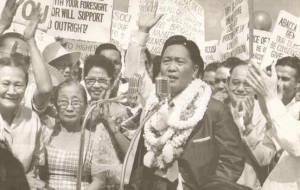 From the History Channel website: "Her husband’s murder propelled her to the front of the People Power Revolution that ousted Ferdinand Marcos, whom she succeeded as Philippine President." The documentary features interviews with movers and shakers in Philippine society and those who worked with the former presidents like former senators Joker Arroyo, Fidel V. Ramos and Jovito Salonga, human rights lawyer Rene Saguisag, Senator Bongbong Marcos, and President Noynoy Aquino, to name a few. 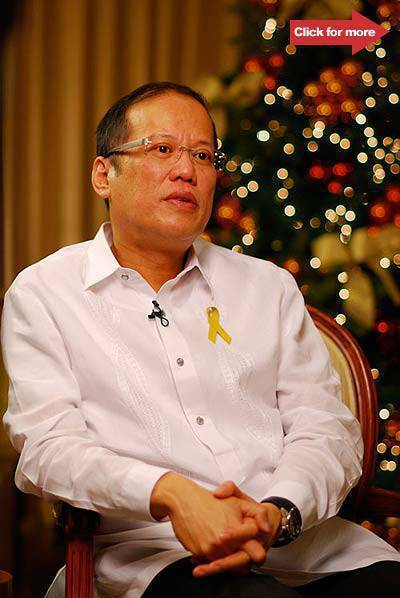 President Noynoy Aquino. Click for more photos. "We also made sure we had people who could look at that time period from an objective point of view," Ifurung says, such as members of the media like columnist Conrado de Quiros, former CNN Philippine Bureau Chief Maria Ressa, and former CBS Philippine Bureau Chief Gabby Tabunar. 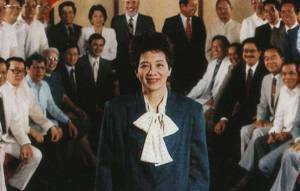 In the dramatizations directed by Mike Alcazaren, Marcos was played by Lex Marcos (no relation to the Marcoses) and Cory Aquino was played by Madz Nicolas. Dante Datu played Juan Ponce Enrile; Conrad Virina, former President Fidel V. Ramos; and Dennis Marasigan, Cardinal Sin. According to executive producer Kara Magsanoc Alikpala, they wanted people to know and remember the price of democracy. "The Marcos years were the darkest in our country’s post-war history," Alikpala says. "Many paid the ultimate price to restore decency, dignity and democracy in the Philippines...We pay tribute to those heroes, many of them unknown, who chose to fight the culture of fear, silence, corruption and intimidation. Cory Aquino became the symbol of the Filipino people who had enough of the dictatorship...Eternal vigilance is the price of democracy. " 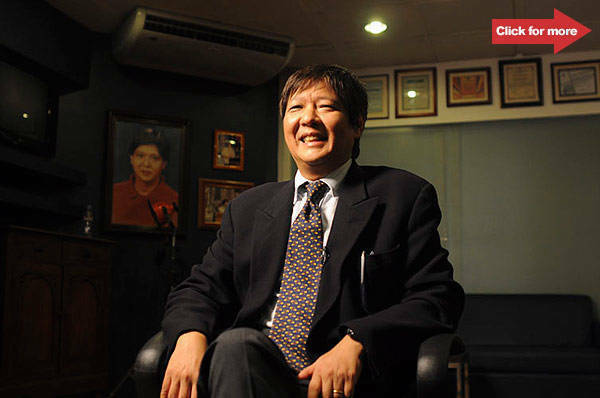 Senator Bongbong Marcos. Click for more photos. January 24, 3:00 a.m., 10 a.m., 6 p.m.
January 26, 11:00 a.m., 5 p.m.
January 31, 1:00 a.m., 1 p.m.
February 10, 7:00 a.m., 1 p.m.
January 31, 3:00 a.m., 10 a.m., 6 p.m.
February 2, 11:00 a.m., 5 p.m.
February 17, 7:00 a.m., 1 p.m.